There is no escape… the crowds are here too, at least on the weekends where throngs of so many walkers/hikers singing "If you're Happy and You Know It…" that you could easily forget your in a valley of tranquility. There are moments of peace, particularly during the weekday here, calm enough to make it worthy, yet I'll admit, I'm a bit disappointed in the scenery, expecting Scotland style backdrops around the ruins. That said, the many ruins of churches, the monastic village, mines and stories of Saint Kevin (and then more stories of St. Kevin) are of quality. I think it was just the over hype of what I've read about the area. 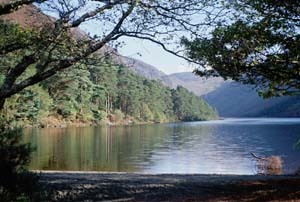 The claims of being the most beautiful place in Ireland I'm sure are disputed on the Southwest peninsulas. I was called out of the retreat house one night to witness one of the most spectacular phenomenons of nature: the Northern Lights! A red blur continued across the sky and on my walk back to the hostel, streaks of white rotated through it. Amazing. A teaser. A lure to the Arctic Winter. 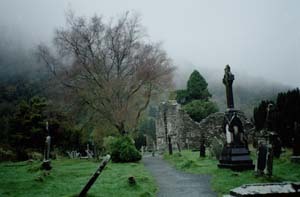 Known as “The Monastic City,” Glendalough was home to an early Celtic monastery, with cathedral ruins and cemetery, building ruins, churches and a round tower still there to experience. The fertile valley, mountains and two lakes were where the legendary St Kevin lived in the mid 500s. A hermit and mystic, Kevin was known for his ascetic lifestyle, close relationship with animals, and reputation for miracles. 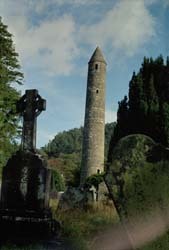 Thousands of pilgrims visited Glendalough when he died. The foundation stones of his beehive shaped prayer cell remain, and the hole in the cliffs above the upper lake where he slept. It is easy to imagine the presence of monks and pilgrims past on the lush Green Road and in the woodlands where they once walked.